The Place: Double Tree Inn Portland Oregon. 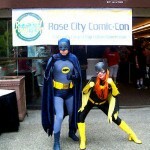 Rose City Comic Con is a first year comic an pop culture convention in attempt to bring a San Diego type comiccon to Portland Oregon. My big Hello Kitty plush was the accompanying plush. The day stared with a hitch; I failed to pre-register ant thought it was going to be a small convention, when I got there around 12:30pm I was instructed to line up, informing us the convention hall had exceeded the maximum of capacity 2500. They eventually allowed allow people to enter 25 at a time and I final go in. There was not much in panels to do. 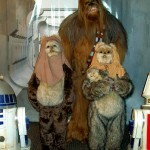 I attended Richard Hatch panel an presentation. Richard Hatch played Apollo on the old Battlestar Galactica Tom Zarek in the Rebooted new series. He was enjoyable and very approachable. 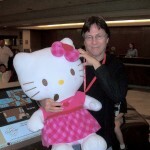 I even got a picture with holding my big Hello Kitty plush. Next I ran around and watched the last half of a interesting moving about live action role players to in a style of a fantasy saga. I regretted missing the first half. 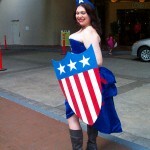 I went out to dinner that to the after party, which was part panel, part trivia contest and part costume contest. The Good: I like the geek after party notable the Nerd folk group the Double Clicks. 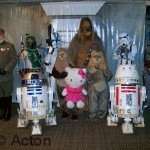 The Star Wars and the 501st Legion group really outdid themselves in costuming. The bad; I wish Rose City had more panels and con space. Orycon had 800 to 1300 attendees but 75% more con space that Rose city Comic con. The ugly: I been to the Lloyd Center Double Tree during Labor Day for Kumoricon and never had any problem going though expositor’s hall but this year the room was stifling hot and stuffy, somebody need to work on the air-conditioning and circulation . 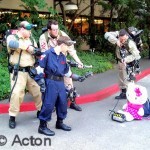 This entry was posted in Conventions, Media and tagged Rose City Comic con by actonrf. Bookmark the permalink.